XS897 first went to 74 Squadron at RAF Tengah in Singapore and then to 56 Squadron at RAF Akrotiri in Cyprus. 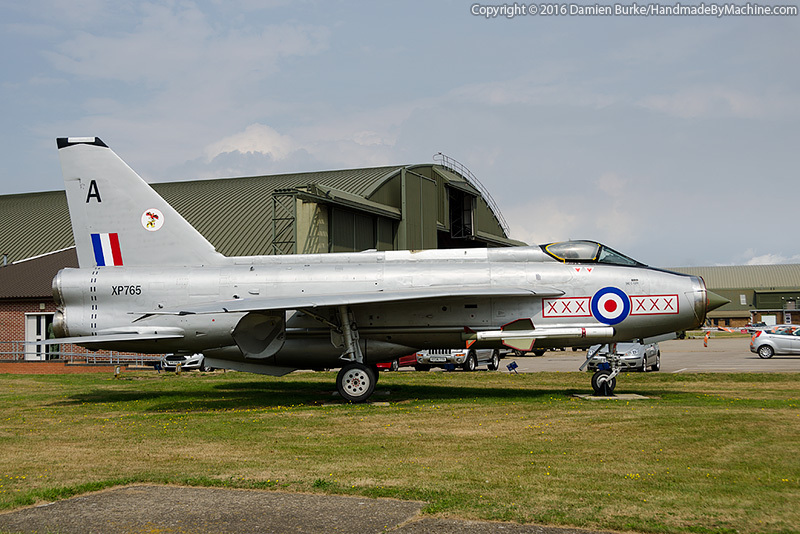 It then spent the rest of its service life at RAF Binbrook in use with 5 and 11 Squadrons. When its service life was over, she was disposed of to a scrap dealer at Rossington near Doncaster. He had high hopes of selling her along with several other Lightnings for oodles of cash, but had no takers (unsurprisingly given the prices he wanted), and began to scrap the lot. XS897 was rescued by an Aeroventure museum member at the eleventh hour as her wings were being smashed off. Restoration continued slowly after that, and included repairs to damage to the fuselage caused during the scrapping attempt and the fitting of a new set of wings. During 2006 she was put up for sale on eBay and Neil Airey of Lakes Lightnings bought her. He initially left her on loan to Aeroventure but in 2009 she moved to RAF Coningsby to take up display duties by the 29 Squadron facilities; Neil has put her on loan to the Squadron. As 29 did not fly the F.6, she was repainted in silver 29 Squadron markings and fitted with a small belly tank to make her look a little more like an F.3! In January 2012 the work was completed and she is now on display. She'll stay with the Squadron for 10 years and the plan is then to loan her to a museum, where she'll be given back her F.6 belly tank - and overwing tanks.